You'll love that refreshing clean smell of fresh hung linen drying in the sun. 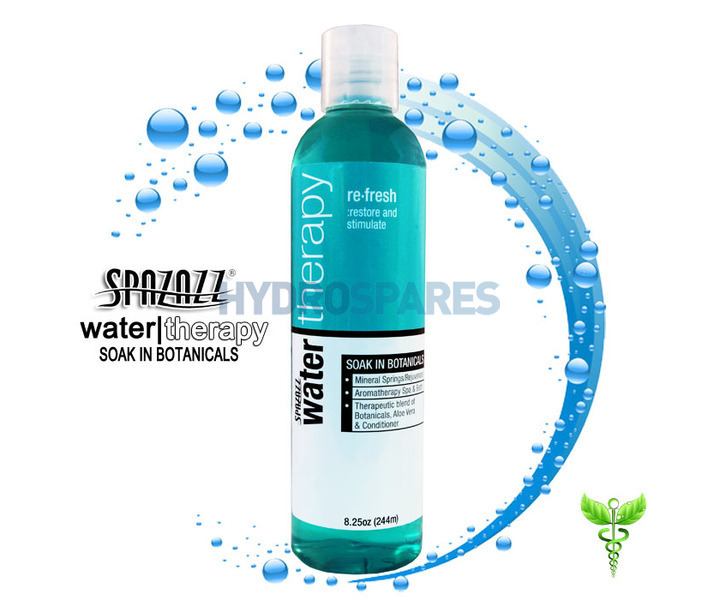 Refresh Water Therapy is designed to refresh, restore, and stimulate the senses. That clean smell after a lightning storm, or maybe the clean feeling smell after a shower on a hot day, or diving into bed at a five star hotel with fresh clean linen. Soak it up! The vitamins and aloe will leave you feeling completely refreshed. Purified Aqua, Herbal Additives, Essential Aromas, Aloe Leaf Juices, Moisterizing Glycerin, Calendula, Arnica, Soapbark, Rosemary, Chamomile, and a few secrets! How are these Pazazz products used i.e. Are they dosed in or the whole bottle goes in. Hello, You add approx a capful or more as required. It just depends on how much frangrance you like. They can be used in Whirlpool baths and Hot tubs.